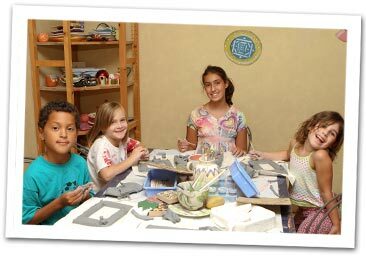 Let your kids beat the summer heat while getting creative in a cool, fun environment. Our standard half-day camp sessions are Monday through Friday, 9 a.m.–1 p.m. for ages 6-14. $200 plus tax. All Campers are required to bring their own lunch and drink. There is a non-refundable deposit of $75 for each camper payable at registration. Standard half-day sessions are $200 plus tax. Early Bird Registration: 10% off the camp fee discounted for sign up by March 31. Sibling Discount: 10% off the camp fee discounted for additional children from the same family (e.g. 1st child @ $200 plus tax, 2nd child @ $180 plus tax for 1 standard half-day session). Cancellation Policy: There is a non-refundable deposit of $75 for each camper payable at registration. Transfers require two weeks notice and are based on available space. If the unfortunate situation occurs that we must cancel any session that you have signed up for due to lack of enrollment, a full refund will be issued. Go back in time to the days of castles and wizards. Pieces this session will be inspired by castle rescues and magical creatures and medieval fun! Create your own clay wand, a castle bank and of course a wise owl friend. It's sure to be an enchanted week! We are embracing all things unicorn this week. Unicorns, rainbows, sparkle and some other mythical creatures as well! Join us to design your own emoji and paint some super cute emoji pieces. We will learn to use color to express emotion. There's so much fun in store! Foxes, owls, and enchanted woodland creatures. Campers will create objects inspired by creatures and planet life deep in the forest. 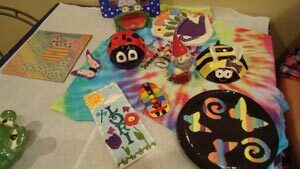 We’ll host an art show on the Monday following each camp session at 6 p.m. We will display your child’s artwork and serve refreshments. Celebrate at our gallery gala and collect your projects to take home! Campers will tie-dye a special Art Camp shirt! Wear the shirt after camp to receive a discount on pottery for the rest of the year! The coordinator of our Art Camp is a licensed art teacher with the Commonwealth of Virginia. Our program is not only fun, but educational!